HIE, or hypoxic ischemic encephalopathy, is an injury to the brain or other body organs such as the kidney, liver, or heart, that is caused by a lack of oxygen to the brain. Since a person’s brain receives oxygen through the flow of blood, any restriction of blood flow to the brain results in a reduction of oxygen to the brain, known as asphyxia. Asphyxia may (but will not always) result in an HIE injury. HIE injuries can be caused by anything that restricts or cuts off oxygen to the brain, including non-fatal drowning, strangulation, or suffocation. HIE may also occur to a fetus or baby during a mother’s pregnancy, labor, or delivery. In some cases, the negligence of a mother’s obstetrician or other medical personnel is a cause of a fetus’s or a baby’s HIE. When this occurs, the obstetrician or medical professional responsible may be found liable for the damages suffered by a child as a result of the HIE injury in an action for medical malpractice. If your child sustained an HIE injury and you believe the injury may have been caused by medical malpractice or negligence, you may be entitled to compensation from those responsible. Birth injury and HIE attorney Jeffrey Killino has extensive experience with all types of birth injury and child injury cases, including those arising out of HIE injuries. Contact attorney Killino at 877-412-8490 for a free evaluation of your case. HIE childbirth injuries can occur as a result of medical malpractice during a patient’s pregnancy, labor, or delivery, and may be caused by anything that cuts off oxygen to a fetus’s brain. The American Academy of Pediatrics (AAP) has reported that low maternal blood pressure, lack of fetal movement, and erratic or falling fetal heart rate are indications of fetal asphyxia that may lead to HIE. If an obstetrician or other medical professional assisting or involved in a pregnant woman’s care negligently fails to detect such signs of fetal asphyxia during the mother’s pregnancy or the labor and delivery stages of childbirth, or to appropriately and timely respond to such signs, the obstetrician or other medical personnel may be found liable for the child’s resulting HIE injuries in a medical malpractice action. Oxygen deprivation to a fetus can occur during a mother’s pregnancy if certain conditions develop in the mother or fetus. If, for example, the umbilical cord becomes wrapped around the fetus’s neck during the mother’s pregnancy, the fetus may experience asphyxia. This is a common occurrence, known as nuchal cord, that obstetricians are trained to recognize and respond to. An emergency Caesarian section may be indicated to save the life of the fetus when this complication occurs if the pregnancy is far enough along to allow for a safe delivery of the fetus. The mother’s high blood pressure, pre-eclampsia, or eclampsia may also lead to a fetus’s HIE injury if not properly and timely diagnosed and treated by the mother’s obstetrician. If an obstetrician’s negligent failure to timely diagnose and treat these maternal conditions is found to have been a cause of a child’s HIE childbirth injury, the obstetrician may be found liable for the damages suffered by the child as a result of his or her HIE injury. Negligent care by medical personnel during the labor and delivery stages of childbirth may also result in fetal asphyxia and HIE. Nuchal cord frequently occurs during labor and delivery as well as pregnancy and must be immediately responded to in order to avoid serious HIE or other injury to the fetus. The failure by medical personnel assisting in a child’s birth to adequately monitor the vital signs of the mother and fetus in order to timely recognize the existence of fetal distress may be found to constitute actionable negligence and liability on the part of such personnel if this negligence is determined to have been a cause of the child’s HIE injury. The negligent failure of an obstetrician to timely order or perform an emergency Caesarian section when indicated may also be found to have caused a fetus’s HIE injury. If, for example, an obstetrician fails to timely order or perform a C-section when nuchal cord is detected and this failure is found to have been a cause of the baby’s HIE childbirth injury, the obstetrician may be found liable for the damages suffered by the child as a result of the injury in an action for medical malpractice. If your child has sustained an HIE childbirth injury and you believe that it was caused by the negligence or malpractice of medical personnel who assisted in your child’s birth, you may be entitled to financial compensation from those responsible for your child’s injury. 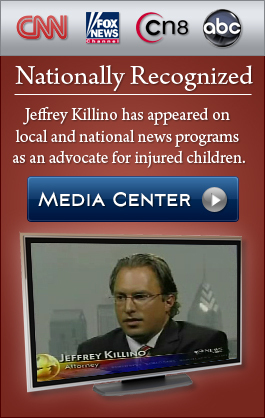 Attorney Jeffrey Killino is a highly regarded birth injury and HIE injury lawyer with extensive experience with all types of childbirth injuries. Contact attorney Jeffrey B. Killino at 877-412-8490 for more information about your legal rights and options.